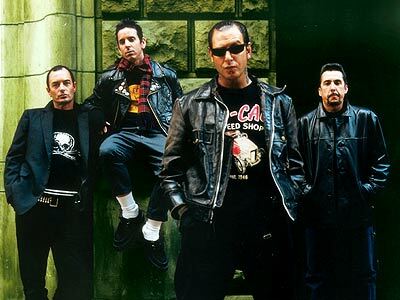 This newest album by the resurgent â€˜80s â€œpunktryâ€ group Social Distortion comes in two versions, regular and deluxe, the former containing eleven and the latter 14 songs. Times and styles change, and bands themselves evolve. 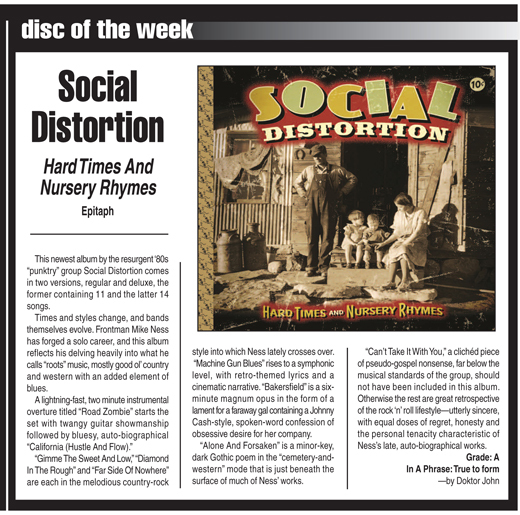 Frontman Mike Ness has forged a solo career of late, and this album reflects his delving heavily into what he calls â€œrootsâ€ music, mostly good olâ€™ country and western with an added element of blues. â€œGimme the Sweet and Low,â€ â€œDiamond In the Roughâ€ and â€œFar Side of Nowhereâ€ are each in the melodious country-rock style into which Ness lately crosses over. â€œMachine Gun Bluesâ€ rises to a symphonic level, with retro-themed lyrics and a cinematic narrative. â€œBakersfieldâ€ is a six-minute magnum opus in the form of a lament for a faraway gal containing a Johnny Cash-style, spoken-word confession of obsessive desire for her company. â€œAlone and Forsakenâ€ is a minor-key, dark Gothic poem in the â€œcemetery-and-westernâ€ mode that is just beneath the surface of much of Nessâ€™s works. â€œCanâ€™t Take It With You,â€ a clichÃ©d piece of pseudo-gospel nonsense, far below the musical standards of the group, should not have been included in this album. Otherwise the rest are great retrospective of the rockabilly lifestyle — utterly sincere, with equal doses of regret, honesty and the personal tenacity characteristic of Nessâ€™s late, autobiographical works.